When a bourbon buddy selects a barrel, you buy a bottle. No-brainer, right? But what do you do when a bourbon buddy selects two barrels and you can only buy one? You purchase the bottle selected from one of your favorite rickhouses, of course. And that’s the situation I found myself in a few months back when Kentucky Supply & Demand (KS&D), a private bourbon group, received their bottles from an April 2018 Wild Turkey barrel tasting. Two barrels had been chosen, one from rickhouse B and the other from rickhouse H. Both are undeniably reputable rickhouses – each with plenty of quality barrels rolled out over this past year. But hey, I’m a sucker for rickhouse B. I just love the rich and intense bakery notes it so often imparts. And so B it was. None of our other warehouses age juice quite like [rickhouse B]. It’s one of those with A that was built in the 1890’s. Built different – built kind of unsafe because it’s right next to the buildings around it. […] But because of that, there’s nice wind tunnels that come in between those buildings that keep those rickhouses drier and airier. It makes for really good whiskey. But just because some folks find rickhouse B a favorite, doesn’t mean everyone will. That’s one of the many beautiful things about Wild Turkey single barrels. Each rickhouse – each floor of each rickhouse adds its signature touch to every barrel racked. Here’s what I came up with on the fly. It’s far from all-inclusive, nor does it break down profile by floor (so consider these mid-floor descriptors), but it covers many of the popular rickhouses you’ll typically find on Russell’s Reserve Single Barrel private selection neck tags. 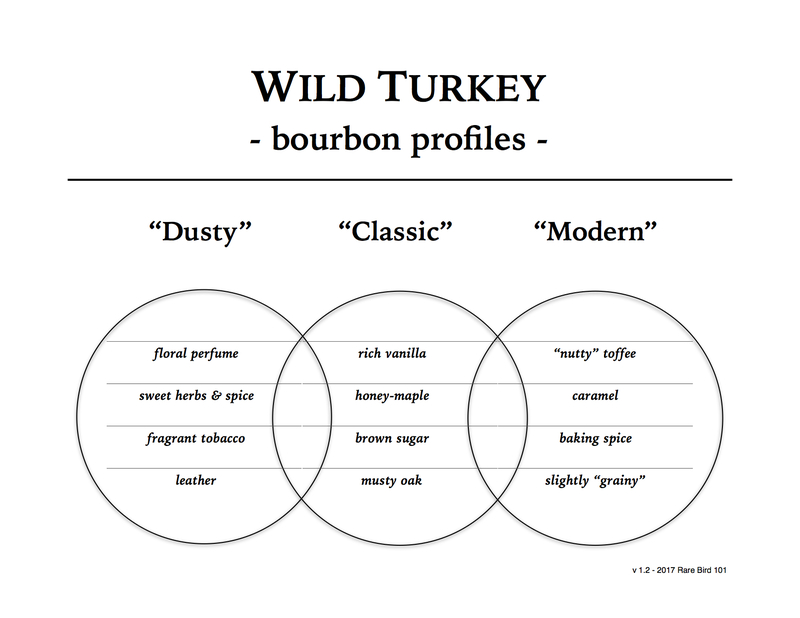 Those are just my own general observations in relation to modern Wild Turkey single barrels. Yours may be very different. It should also be noted that these are traits relative to Tyrone rickhouses (not McBrayer or Camp Nelson). In fact, many 2018 Russell’s Reserve Single Barrel private selection tags omitted the “CN” for Camp Nelson. So if you see a 2018 private selection stating the rickhouse as A or F, it was very likely aged at Camp Nelson, not on-site at Tyrone (as Tyrone rickhouses A and F weren’t in general private selection rotation this year). Well, I think that covers the nerdy stuff. It’s time to find out if Fight Me stands toe to toe with previously reviewed rickhouse B selections and the familiar bakery-forward profile I’m expecting. Wanna ring the bell, Apollo? Overall: While not immensely diverse notewise, Fight Me is an incredibly delicious pour in nearly every capacity – nose, taste, and finish. Its complexity lies in its depth and intensity, with (even more than the expected) thick and robust rickhouse B bakery notes. I’ve had several selections comparable in quality to Fight Me. Beast Masters’ “That Old Kentucky Chew” #17-114, which I reviewed this past summer, immediately comes to mind. A pour like Fight Me is one of those that you never regret picking up. Occasionally, I’ve pulled the trigger on a Russell’s Reserve Single Barrel selection only to end up feeling that I would’ve been just as happy with a non-select retail bottle. It doesn’t happen often (and isn’t necessarily a bad thing), but when it does it’s somewhat of a disappointment. After all, I want variety in my single-barrel whiskeys. That doesn’t necessarily mean a selection has to be “off profile.” It just means that I’d prefer each bottle to add something new or different to my overall sipping rotation. At the end of the bout, Fight Me is a pound-for-pound Russell’s Rumbler – a heavyweight Bourbon Brawler – a Kentucky Stallion. As each round’s gone by I’ve remained consistently impressed with its hardy, yet entirely approachable profile. Sure there’s more complex bourbons out there, but few with this level of depth in flavor at 110 proof. Fight Me excels at the fundamentals and comes out swinging with heart. A TKO by any bourbon standard. Cheers! Wow, thanks! I was hoping you would do a lists of the characteristics of WT”s rickhouses. Great! Yikes! You sound a little unhappy. My apologies. I’m only trying to share my honest opinion – on this and so many others. There’s plenty of reviews on this site featuring retail bottles. Maybe give those a try? And I’m always happy to answer any questions directly. Shoot me an email if I can help. Thanks! I enjoy the single barrel reviews. Certainly most bourbon folks have dealt with ‘fomo’ at times. That is what is fun with single barrels, find a good one and load up. I think RB101 does a good job with his reviews. The rickhouse guide is handy. You may not be able to get ‘Fight Me’ but if the B profile sounds good to you, seek some out in your market. There are reviews of all mainline WT offerings here, can’t expect RB101 to review Rare Breed every 6 weeks. Glad you liked the post, Jon. Thanks for the feedback! Good stuff as always. I know what you mean about wanting private picks to be unique or spectacular. Nothing wrong with the middle of the road standard Russell’s Reserve Sib profile, but if I wanted that I’d just grab a retail bottle. My thoughts exactly. Thanks Scott! What about the F warehouse? Thoughts on that? Is that the only Camp Nelson warehouse (F), or are there others? I know very little about CN. I would love to see a stand-alone warehouse details post. Would also be much easier to reference/link to (aka many more clicks/site visits!). Honestly, it’s hard to say. There’s a Tyrone F and a Camp Nelson F. WT has owned Camp Nelson since Seagrams left the rickhouses. Wish I had a date. It was when they started using Cox’s Creek, I believe. Only in mid 2018 did WT start labeling CN (and not for every pick either). Gotcha, thanks. I have an “F” warehouse RRSiB, but don’t know much more than that. 2018 so CNF. I like CNF! It’s very good. The A warehouse I picked up recently has also been excellent. Can’t go wrong. Yep. That’s most likely CNA. Enjoy!